"DAN BROWN," reads the cover of a novel on the bookstore shelf. It's in huge, block letter font, "BROWN" taking up about a quarter of the cover. Underneath, smaller, much smaller, it says "SIMON KERNICK." Then, bigger again, "DEADLINE." 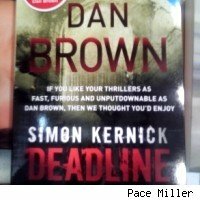 A Marketing Week writer who caught site of the book in a WHSmith bookshop in London picked it up, wondering if Brown (author of The Da Vinci Code and Angels & Demons, the two of his books that have been made into movies) was writing a story about a young female journalist, on a deadline. She could only hope! But "Simon Kernick: Deadline"? Was Simon the journalist? Or . . .
Or nothing. The book cover was a strange (and, it appears, authorized by Kernick and Brown) marketing strategy by the publisher, TransWorld, which counts among its authors both Brown and Kernick, and evidently feels that Dan Brown fans will be enticed to while away the months between his books by reading Kernick's not-inconsiderable oeuvre. The book cover, which was a special edition of a year-old title given free to readers who pre-ordered Brown's forthcoming sequel to The Da Vinci Code, The Lost Symbol, set off a firestorm of internet controversy. Ruth Mortimer, who touched off the conversation, was by far the most circumspect in her criticism, writing, "Rather than piggybacking Kernick's work on Brown's brand, it should have tried to develop the author's own distinctive style and reputation more carefully. I appreciate it's trying to shift copies in a difficult climate but there is more than enough room for another star brand on the bookshelves. So come on, Corgi; there is never a deadline for innovative marketing." Others were not so reserved. Blogger Pace Miller called it "the most disgraceful book title ever." Crime writer and industry pundit Sarah Weinman's initial response was "Talk about a jaw-dropping, epic, book marketing fail." (She later went on to chat via email with Wernick and his publisher, and decided "Unorthodox, or even blatant, as this particular promotion was, the bottom line is that so far, it's working for Simon Kernick.) Susan Gardner from Quill & Quire called the use of Brown's name to market Kernick's work "one of the most blatant abuses of this questionable technique." I wrote my friend, a former book editor responsible for overseeing book jacket design and a scholar of book covers, Todd Silverstein. He summed up his long response this way: "The team behind this cover appear to be exhibiting an advanced case of promotional Tourette's, blended with a noxious stew of schizophrenic professional insecurity." He wrote that this is not an unusual marketing ploy, though it is unusual in its extent. "And the promotions at work here (badly) are nothing special: first, offer the book as an exclusive (upper left, in blue triangle); second, give away a free product with the pre-order of another (upper right, in red circle); third, help sell a new name by pairing it with a more successful and established one (central text in red and white); fourth, and finally, also throw in additional offers that the reader may value (red text, bottom of cover). It's almost a wonder they were able to get the actual title of the book and actual author on the cover at all," he said. While Kernick and his publisher seem pleased with the results of the marketing, everyone else seems to agree that it does both Kernick and fans of Dan Brown a disservice, not only because of its deceptive nature but because Kernick and Brown are really nothing alike. Fans of Kernick are in love with the book, calling it his "best ever," but some fans of Brown who read it as a freebie think it's awful. A great example of "no PR is bad PR" or the worst book marketing, ever? Silverstein summed it up for me: "I don't think I could design a better example of what not to do on a cover (not to mention the fact that I think the aesthetics are not inspiring at best)." Back to the drawing board, Transworld: let's come up with a better way to monetize your investment in two totally different, but equally gripping, authors.